I don’t know about you, but I’m a bit obsessed with mashed potatoes. This dish— it seems unappealing, unappetizing on a plate, but somehow, a spoonful on that creamy, smooth mash always end up being my favorite part of my meal. And if I got some time to squeeze on my day, I’d love getting my hands on that mashed potato and flour and creating a homemade gnocchi, too! Those regular dense potatoes turned into something tender, little pillowy dumplings would complete my day anytime! If you ditch the food processor, stand mixer, or hand masher, and use the best potato ricer instead, you are almost guaranteed to get those perfect mashed potatoes you search for, every time! What is a Potato Ricer? Do I really Need a Potato Ricer? How to Use a Potato Ricer? A potato ricer is a kitchen tool used to process potatoes or other foods by forcing it through a sheet of small holes that are usually about a diameter of grain rice. Usually resembling a garlic press, potato ricers come with two long handles, one with a flat surface which sits into the basket, the other with a perforated basket at the end. The food is placed in the basket, then the flat surface is pushed down by pressing the handles together which forces the food through the holes. A lot of people tend to mix up potato ricers and potato mashers. So, let me clear that confusion. Being an extrusion tool, potato ricers force cooked potato through tiny holes and delivers rice-like pieces of potato, thus its name. A potato masher, on the other hand, is a tool you use to push down on potatoes and create a mashed texture. You see, potato ricers are much better than mashers. Ricers break potatoes into the smallest pieces possible without even disturbing the starch molecules, producing airy and fluffy mashed potatoes. Whereas, mashers often leave lumps and is also quite exhausting to use. Although some people might argue that you can have your mashing needs with a food mill or a masher, a potato ricer brings you some benefits that just are not there when choosing other mashing tools. Like I’ve said before, potato ricers produce fluffy, smooth and lump-free potatoes every time! You also do not need to peel the potatoes before mashing them since the peels will remain in the hopper of the ricer when the clean mash is squeezed out. Moreover, potato ricers are crucial for home cooks who wish to create restaurant quality gnocchi. And if you think that you do not need it that much since it only has one role, then you got it wrong. Potato ricer may be its name, but this kitchen tool is not limited to mashing potatoes. It can be used for several other culinary tasks such as creating homemade jam, applesauce, baby purees as well as squeezing liquid out of veggies such as spinach, cucumber, and spaetzle. Potato ricers are simple to use, thanks to straightforward features. It is also non-electric and hand-held, which makes it easy to travel with whenever you go camping. Lastly, they are easy to clean and most models only require you to throw it to the dishwasher. Wash the potatoes thoroughly. Cut them into smaller pieces about 1-inch cubed. Cook the sliced potatoes in boiling water for at least 15 minutes or until soft enough to break up when pressed with a fork. Drain the potatoes. Fill the basket of the potato ricer with a few pieces. Make sure not to overfill the basket or the potatoes might ooze out to the sides. In case your potato ricer comes with a choice of discs, use the one with the largest holes. Hold the potato ricer over a bowl or an empty pot and squeeze the handles together until the potatoes begin to extrude through the holes. Refill and press again, working quickly before the potatoes get cold. After mashing, add your desired ingredients such as nutmeg, pepper, salt, warm milk, sour cream, or butter. Stir with a spoon to combine. As I have said before, potatoes are not the only food you can use on a ricer. Here’s how you can use a potato ricer on other foods. Make a spaetzle with the potato ricer by pressing the dough into boiling water, forming the noodles. Steam foods such as broccoli, peas, or apples until very soft. Add it into the ricer and press into a puree for baby food. Cook fresh berries or thaw frozen berries in a saucepan with a bit of sugar until soft. Press the berries through the ricer into a bowl in order to make a fruit sauce or coulis. Now that you are convinced that you really need a potato ricer in your kitchen arsenal, you might be wondering how to choose the best one out there. Well, here is a detailed guide to help you choose the right one for you! Take note the potato ricers are usually made of plastic or stainless steel. Usually, however, the most preferred is one made of stainless steel. Plastics are commonly less durable and much prone to damage while stainless steel can last longer, enduring more abuse. Some ricers come with the addition of ergonomic grips or rubber grips that can be quite helpful for pureeing larger amounts of veggies and fruits. No one expects you to turn the potato ricer upside down and start counting how much holes which might confuse the sale associates. But, what you can do is to assess the density of the holes and the width. The more hole that the potato ricer has, then the better chances of it delivering a more consistent and smoother texture. If the holes are just too big, then you might end up with lumps like those that can be produced with a potato masher. Even though made in stainless steel, there are some potato ricers that comes in poor build quality, particularly if they are not well connected to the bolts and screws. Being loosely connected can make them prone to falling apart, or of connected to firmly, it makes them harder to operate since they can lack flexibility. Also, look for a potato ricer that can take a lot of abuse that can mash several potatoes at once or puree harder food items. Potato ricers are pretty much straightforward to use. However, there can be some models that make it difficult to use. The best potato ricers come fully equipped with a non-slip knob that is opposite to the handle so that you can rest on the bowl and have more leverage when operating it. One component that you need to always look carefully when buying the best potato ricer is its mill features or much commonly known as the hopper. This is the part where you need to put the potato before you press it through the holes. The hopper needs to be large enough in order to fit a potato— either cut into smaller pieces or as a whole. Moreover, you also need to consider its press apparatus to be sturdy and functional. Lastly, the handle of the best potato ricer needs to be easy to hold and grip. Consider those with a rubberized coating in order to avoid slipping when using. Ergonomic handles can also make the job of grating and mashing a potato easy even for children who naturally have weaker hands. Even though you can easily put a whole apple in almost any potato ricer out there, what happens if you wish for a different texture than a gnocchi-ready puree? Do you prefer going out there and buying another ricer for such an occasion? Or look for one that comes with interchangeable discs of different sizes and numbers of the holes? I bet you prefer the latter. Well, obviously, you should not spare on the money if you want to buy good-quality kitchen products. That is, unless if you want to come back to your kitchen store and buy new ones every few months. But, always remember that a higher price does not always mean higher quality. If you consider all the factors mentioned above, then you should be able to make the right purchase and consider only the price as the last criteria to finalize your decision. 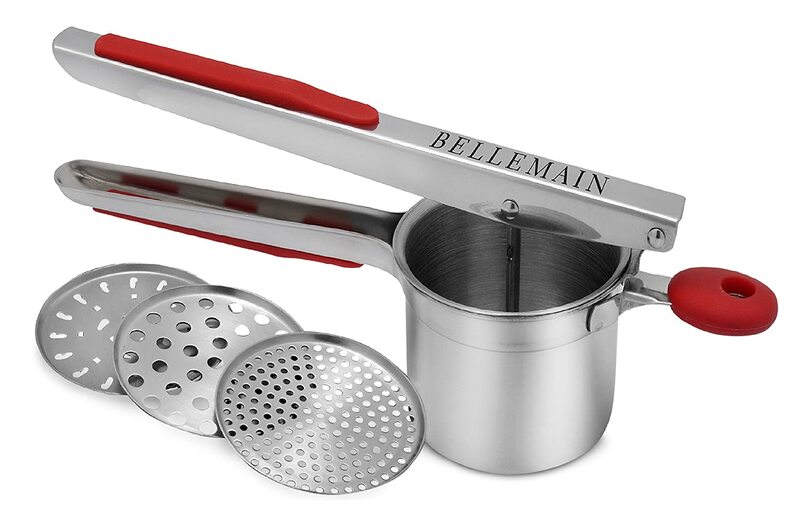 Create outstanding potato dishes with this amazing potato ricer from Bellemain! 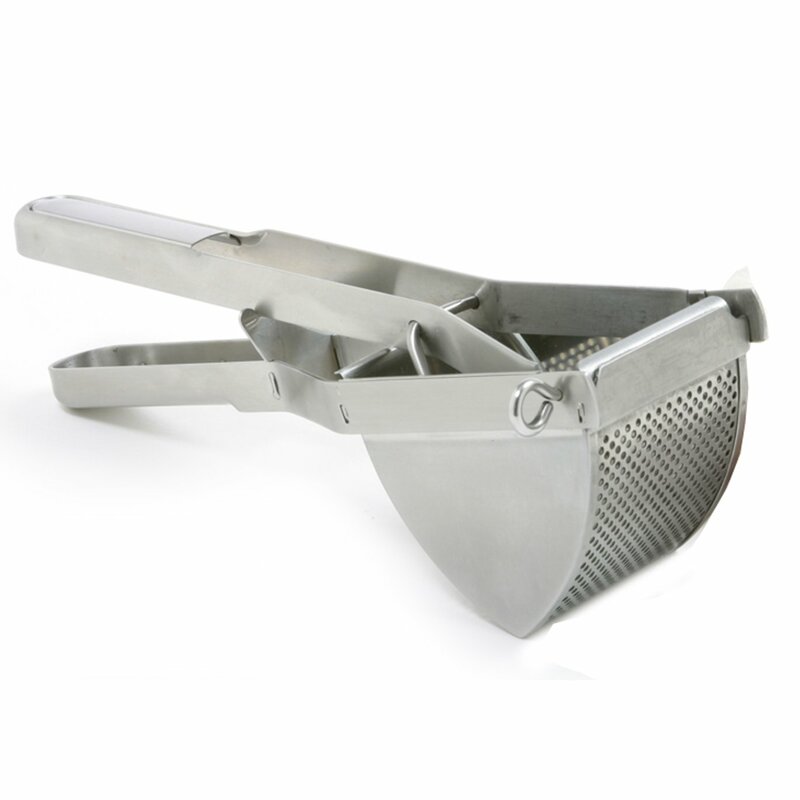 Made from high-quality, heavy-duty 18/10 polished stainless steel, the Bellamain potato ricer indicates a long-lasting design that should last for generations! Easily create perfectly creamy, smooth and fluffy mashed potatoes with this instrument as the comfortably cushioned, form-fitting, bright red, long handles require you to use less of your hand strength. The ricer features a good sized basket to make at least 1.5 cups of mashed potatoes, baby food or cauliflower mash. Plus, the large non-slip red knob securely holds the ricer in place on a bowl or a pot. Not only that, you can get really creative, thanks to Bellamain offering a complete set of 3 interchangeable ricing discs for different coarseness or fineness. It is also very easy to clean— you can either soak it in soapy water or throw it in the dishwasher! This is such an amazing kitchen gadget to buy, however, if you are not that satisfied, Bellamain offers a 100 percent refund guarantee, no questions asked! Oh, plus, it also comes with a 2-year warranty for a risk-free buying! Whether you want to create perfectly fluffy, light and smooth mashed potatoes or homemade pureed baby food or restaurant quality, pillowy gnocchi, the OXO Good Grip Potato Ricer can do it all! Coming with a durable and sturdy stainless steel construction, this potato ricer can produce perfectly smooth texture every time, to the point that there you will not need to add milk and butter to the potatoes. Other than easily mashing potatoes, it also allows you to mash fruits and veggies such as apples, yams, cauliflower, carrots and more! The potato ricer boasts soft and comfortable non-slip grips on its handles that conform to the shape of your hand and also absorb pressure as squeeze it together. 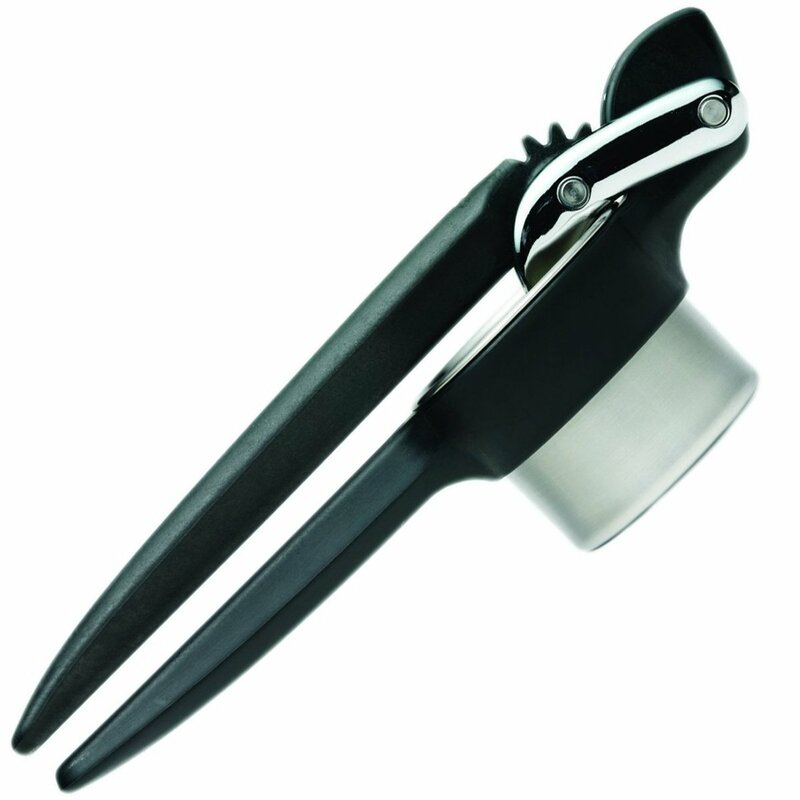 It also features non-slip cushioned knob that securely hooks onto any type of bowl or pot. Cleaning is also a breeze— a few scrubs of soapy water and rinses it with running water and you’re done or you can just throw it to the dishwasher! Equipped with a hanging hole, you can hang it for easy and quick storage! If you are obsessed with mashed potatoes or working in a restaurant, then the Norpro Potato Ricer is second to none when it comes to preparing lots of fluffy, light, soft a lump-free mashed potatoes. For fast and easy mashing of large batches of potatoes, this potato ricer is constructed from commercial grade, high-quality stainless steel. Having a whopping capacity of 2.75 cups, you can create batches by batches of mashed potatoes in no time! Also, thanks to its unique design and shape, this potato ricer is definitely easier to press than most models. Its sturdy handle offers you good leverage, plus it fits nicely over most pans and pots for an easy potato “ricing” operation without the mess! Not only for mashing potatoes, the Norpro Potato Ricer can also mash veggies like tomatoes, yams, cauliflower, and carrots, fruits like apples and even allow you to create baby foods. Cleaning is not that easy though thanks to its shape which creates lots of nooks and crannies and because it is not dishwasher-safe, some of its parts can be cleaned with soapy water. Talk about fast and effortless operation, the FreshForce Potato Ricer from Chef’n is definitely a joy to use! The stainless steel ricer comes with a gear-powered mechanism that helps push down the potato through the hopper, thus requiring less strength from you and makes it easy for one-handed operation. Its handle is constructed from heavy-duty plastic that is padded and super comfortable in order to minimize hand strain. Having a fair-sized hopper with small holes, you get fluffy and light mash potatoes every time. It also allows you to prepare other food such as gnocchi, potato croquettes, shepherd’s pie, and baby food. Thanks to its simple, 2-construction design, you can remove the stainless steel basket and wash it with warm, soapy water or go directly into the dishwasher! Making restaurant-quality mashed potatoes from the comfort of your own home has never been easier with the Tundras Potato Ricer. With this potato ricer, you can create top-quality dishes with absolute ease. 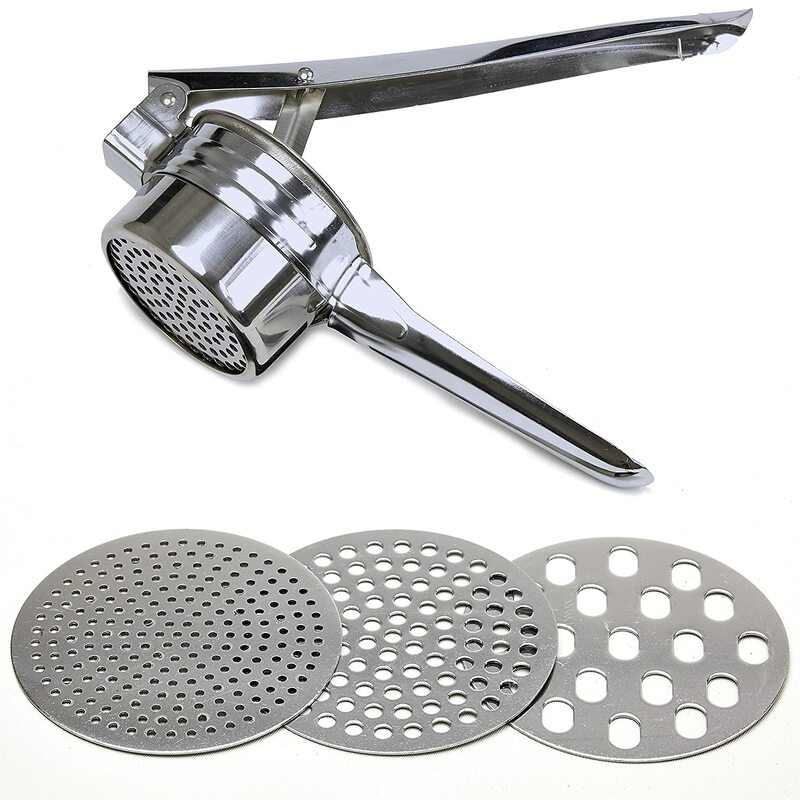 The potato ricer comes with 3 interchangeable discs which give you full control of your meals. You can choose from coarse, medium and fine sized grains for making baby food, mashed potatoes, mashed squash, gnocchi and more! Featuring an easy grip handles, the ricer significantly reduces tension and stress on your wrists and hands so you can mash easily and quickly. Thanks to its stainless steel construction, the ricer is guaranteed to last long that can mash even the toughest of potatoes. We simply can’t end the article without announcing the best of the best, can’t we? 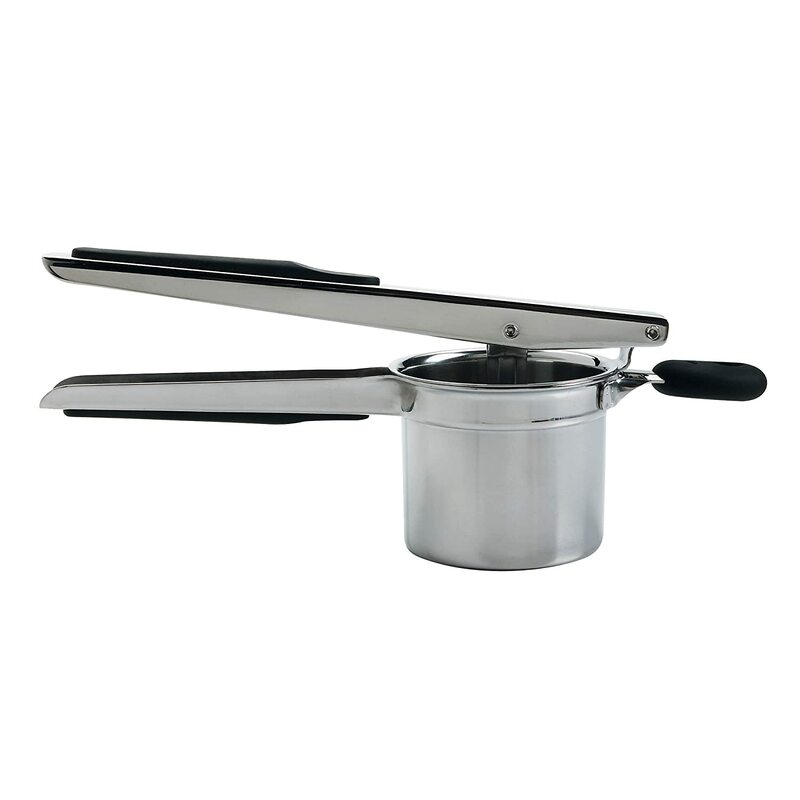 Bellemain Stainless Steel Potato Ricer! Reputable name, heavy-duty stainless steel, easy to operate, long handles, good capacity, comes with 3 interchangeable discs, dishwasher safe and offers risk-free buying— I mean what more will you ask? Everything good points to this superb kitchen tool for you to create yummy, creamy, and fluffy mashed potatoes, every time! Whether you are making mash for your side dish or want some homemade gnocchi or creating tasty toppings for your Shepherd’s pie or even a healthy pureed food for your little one, a good potato ricer can help you achieve that quality mash that the whole family will surely love. I hope you find this article helpful! If you have questions or maybe a tasty potato recipe, feel free to share it with the community and fire up the comment section below! NextNext post:Missing a Drop of Peanut Oil? Here are 9 Worthy Peanut Oil Substitutes!